Missile defence was one of the potential areas for strategic partnership between the US and India identified in the Next Steps in Strategic Partnership (NSSP) in January 2004. June 2005, as part of the "New Framework for the U.S.-India Defense Relationship," signed by US Defense Secretary Donald Rumsfeld and Indian Defense Minister Pranab Mukherjee, the United States offered India increased opportunities for technology transfer, collaboration, co-production, and research and development, with the understanding that US technology-related sanctions on India will be lifted. The US turned down Israel's request to transfer the Arrow-II (a US-Israel joint venture) to India, despite it being an endo-atmospheric (range within Earth's atmosphere) system, though it agreed to transfer the Green Pine Radar. Two Green Pine units were transfered to India around July 2002 for evaluation. One was sent for trial to the national capital area and another was placed closer to the border to permit surveillance of Pakistani tests. Then in August 2005 India's Defense Secretary Yogendera Narain revealed that, after three to four years of discussions, India had acquired a third Green Pine radar from Israel for "advanced research". The Green Pine radar is an electronically scanned, solid state, phased array radar that can detect targets up to ranges of about 500km and is able to track targets up to speeds of 3.000m/s. In February 2003 it was reported that India had agreed to invest approximately $150 million in Israel's Arrow-2 anti-missile system. Since the Arrow 2 project is a joint U.S.-Israeli initiative, the United States can deny the export of the Arrow missiles to India. Due to the tensions between Pakistan and India it was unlikely that the United States will allow the export of the Arrow 2 missiles to India despite the United State’s support of Ballistic Missile Defense (BMD). Indian BMD experimentats progressed rapidly after the DRDO convinced the government on its ability to develop BMD technology. DRDO is testing a two-tier BMD (ballistic missile defence) system, capable of tracking and destroying incoming hostile missiles both inside (endo) and outside (exo) the earth's atmosphere. DRDO's BMD program has a two-tiered system consisting of two interceptor missiles, namely Prithvi Air Defence (PAD) for high altitude interception and Advanced Air Defence (AAD) for lower altitude interception. 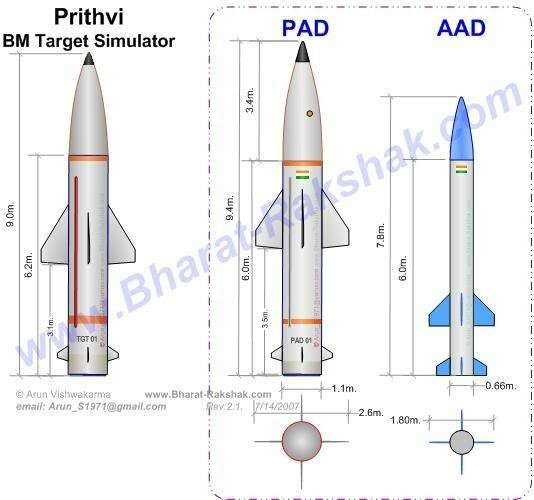 The PAD missiles are for intercepting ballistic missiles at altitudes between 50-80 km and the Advanced Air Defence (AAD) missile is for destroying them at heights between 15-30 km [the capability aspired by the Akash]. After the third test in early 2009, plans called for a test of the endo and exo together in an integrated mode later in 2009. DRDO said the first phase of the system would be developed by 2011. If the tests prove successful, it was said the DRDO would go ahead with the deployment of the BMD by 2015. V.K. Saraswat, Director-General of DRDO assured in 2011 that the first phase of the indigenous Ballistic Missile Defence System to intercept and destroy incoming enemy missiles of less than 2,000-km range is expected to be deployed by 2015. He added that the first phase would be made operational through the new concept of ‘capability-based deployment.’ But both Missile Threat and Duncan Lenox of Janes believed as of 2013 that both the AAD and PAD systems are believed to be project demonstrators rather than full scale systems being prepared for operational service. The initial phase of India's BMD effort is focused on intercepting missiles with a range of less than 2,000 kilometers, that is, Pakistan. Islamabad’s greatest fear of Indo-American missile defense cooperation is that Indian political-military behavior will become more pugnacious under a BMD umbrella encouraging Indian pre-emptive air strikes into Pakistan. Pakistan may respond to an Indian BMD capability by increasing its SRBM and MRBM production in order to overwhelm the Indian anti-missile shield. The initial phase of India's BMD effort is focused on intercepting missiles with a range of up to 5,000 kilometers, that is, China. To tackle missiles with a striking range of over 6,000 km, hypersonic interceptor missiles will have to be developed for the phase 2 of the defence program. Plans are also afoot to have space-based surveillance systems to ensure a hostile threat can be detected even earlier than the present long-range tracking radars (LRTRs) used in the BMD system.